Michael Okerlund "Mike" Leavitt is an American Republican politician. 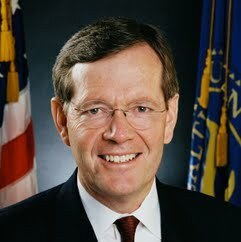 He served as the 14th Governor of Utah from 1993 to 2003, as Administrator of the Environmental Protection Agency from 2003 to 2005 and as Secretary of Health and Human Services from 2005 to 2009. Leavitt serves as a co-leader of the Nutrition and Physical Activity Initiative at the Bipartisan Policy Center.